This weeks Punchbag Blog KO of the week goes to David Price who stopped Matt Skelton in the fourth round. Price was roughed up a bit in the first, but he worked off of his jab and landed some hard power shots to the head and body in the second, the body shots closed the show. 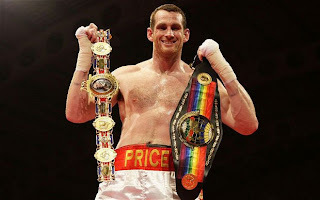 So Price improves to 15-0 13KO, what did you think of his performance? Who would you like to see him fight next? ?